Great little fold out for UC and their 1964 season. Great shape and clean with no agency stamp. 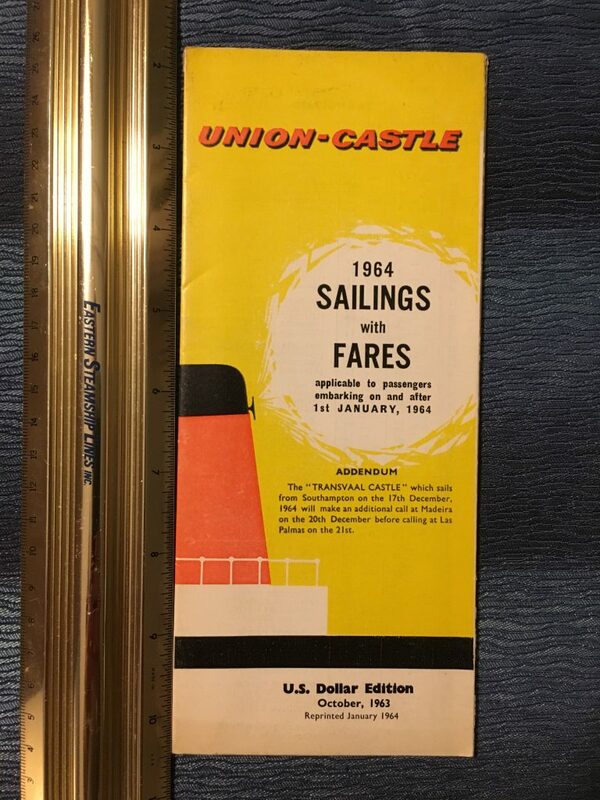 Great graphics on this UC rate schedule for 1965. Great condition! 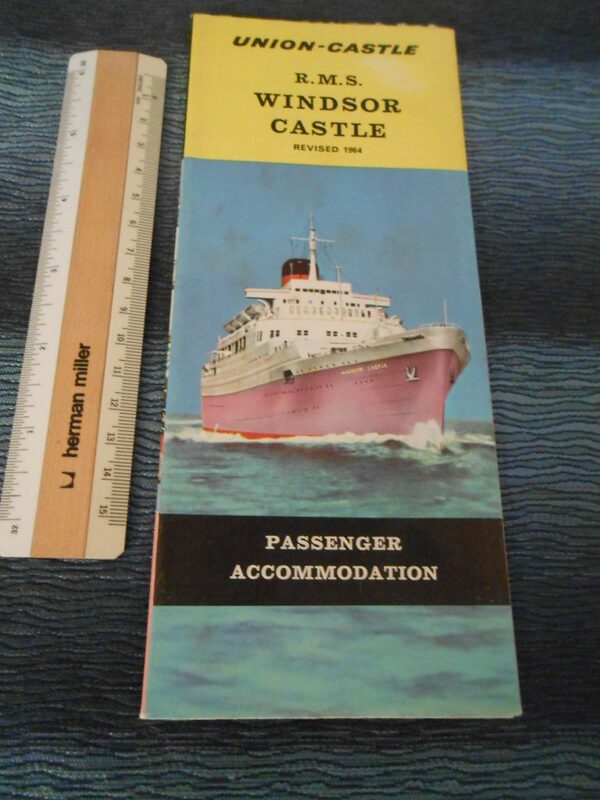 This plan from September 1968 is printed one very heavy stock paper and appears to have never of been opened. Excellent condition and well detailed plan … love the little bit and pieces of furniture shown. 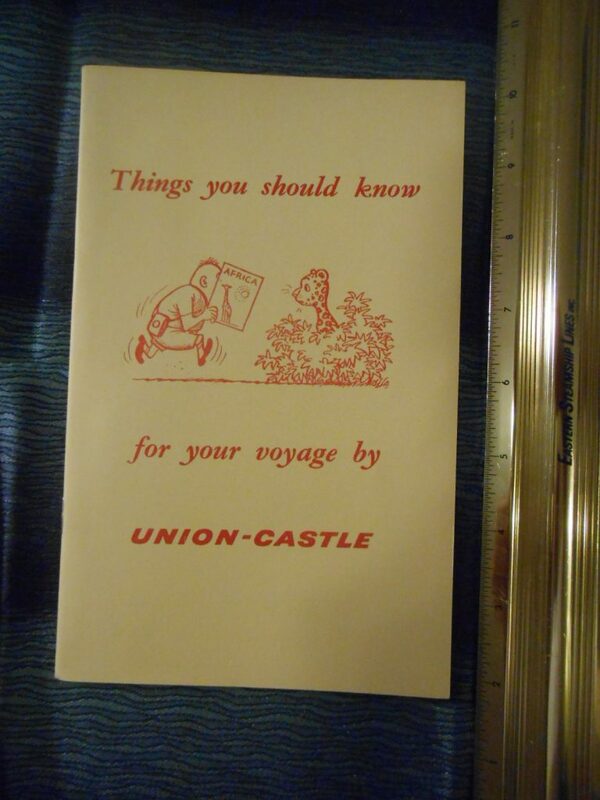 Union Castle: Things You Should Know” Booklet. Great little booklet listing all sorts of facts (about 60 items) you would need to know from Accommodations right down the list to Wines. There are very cute little cartoons throughout by an artist names Thelwell. 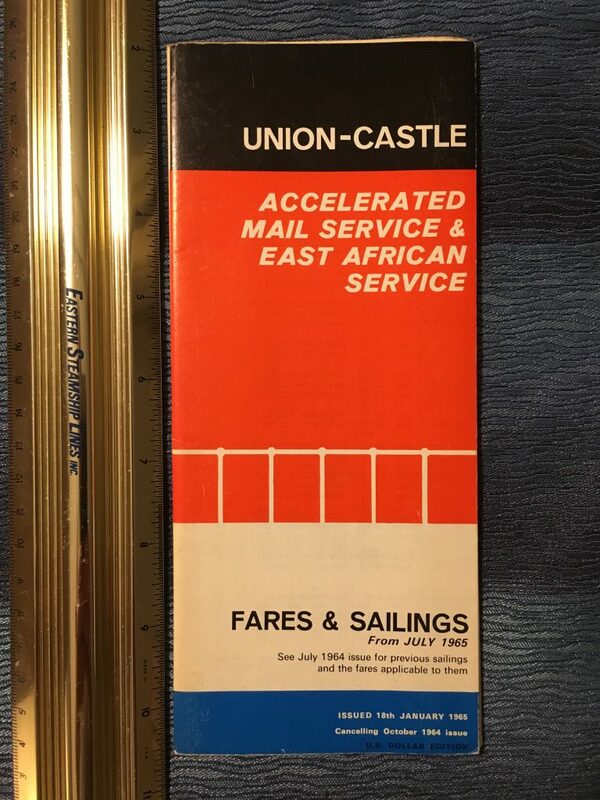 Union Castle: Older Early Advertising card. 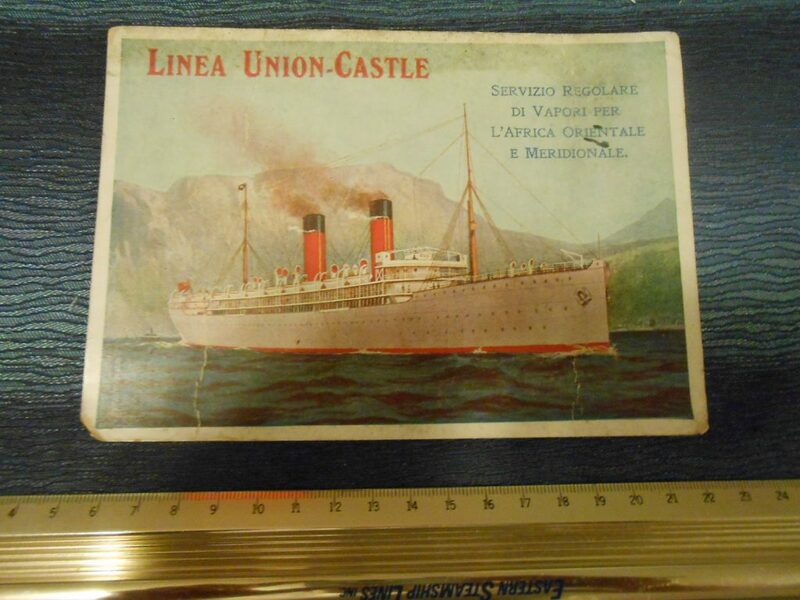 Great little image of a early UC steamer… not sure which one … but I bet she was some type of “fill in the blank” Castle. I have always loved the light lavender hulls. Some age spots and general wear… great little for framing. 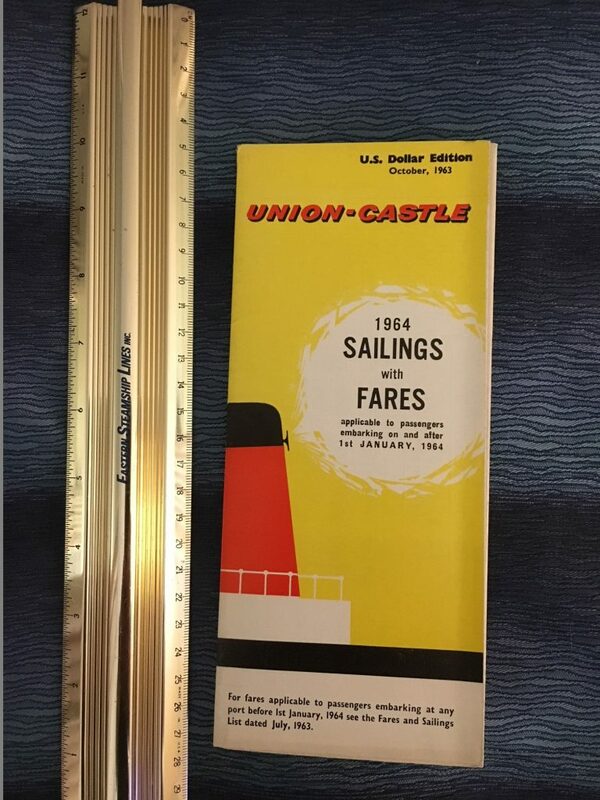 Excellent deck plan for my favorite Union Castle ship. She was pretty sleek and modern .. thought her interiors were pretty “eh” and rumored to be greatly influenced by the chairman of the boards wife (certainly a dolly decorator). Great plan in great shape though! Built in 1960, she would be one of the last UC ships. Sold out of the fleet to the Lastis family, she would become an accommodation ship Margarita L for the next 25 year or so. She was scrapped in Alang in the early 2000’s. Excellent condition. Built in 1947, I think she was on of UC’s most beautiful ships. Lovely deckplan with excellent interior pictures … this will be a great addition to any collection. 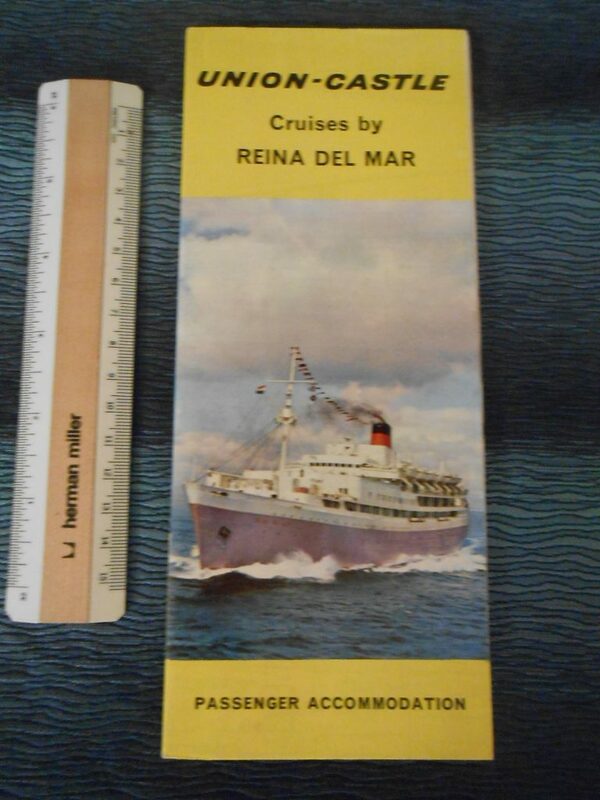 Lovely full color deck plan for the Reina Del mar. She joined the UCV fleet when sold by Pacific Steam. Just love her mod interior spaces. I think I preferred her in PSN colors though. 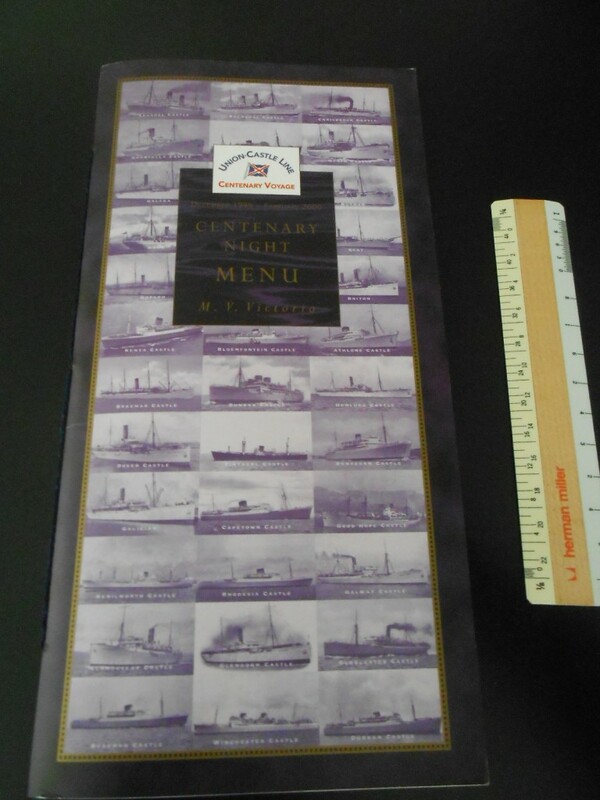 Very interesting item for the UCL .. when they chartered the MV Victoria for a 2 month Voyage from Dec 1999 thru February 2000. the center fold menu is quite extensive … lots of food and dishes … I would have been quite full! Menu .. is actually much broader … more of a brochure. There is a historical UCL fleet list and repo snapshots of scenes onboard UCL ships including several launching photos … this is almost a mini fleet history with many photos! 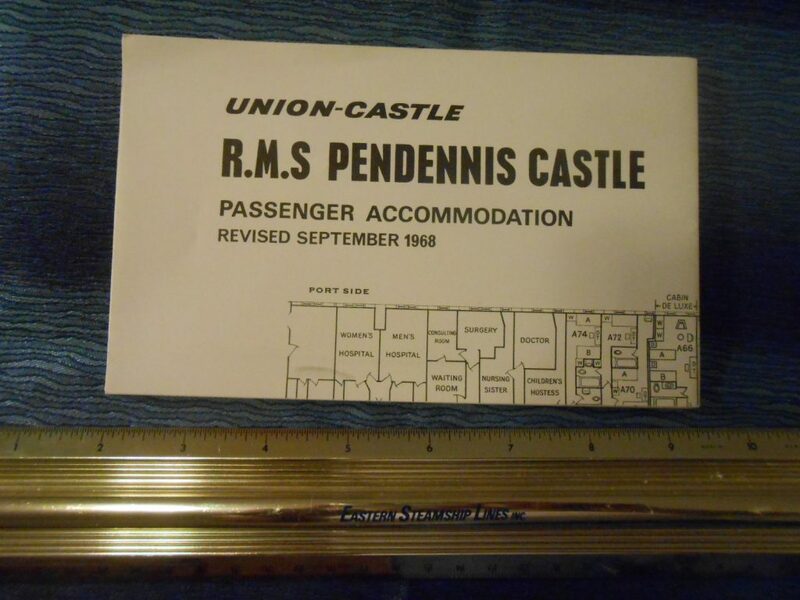 Wonderful heavy tissue stock deck plan for one of the UC’s last ships … the Pendennis Castle. This shows accommodations as it was revised in September 1968. 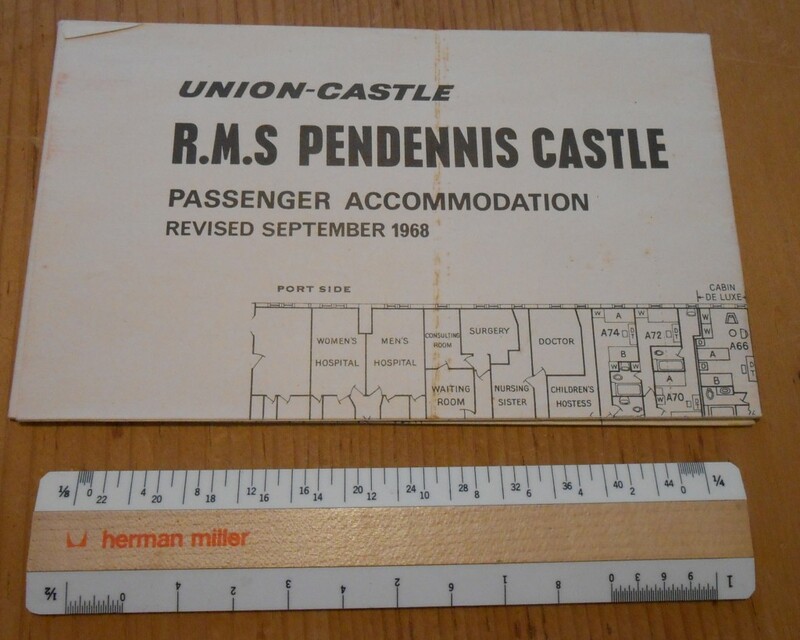 Within a decade, Union Castle would be out of the passenger carrying business. This is in great shape , other than a rusty line on the cover. 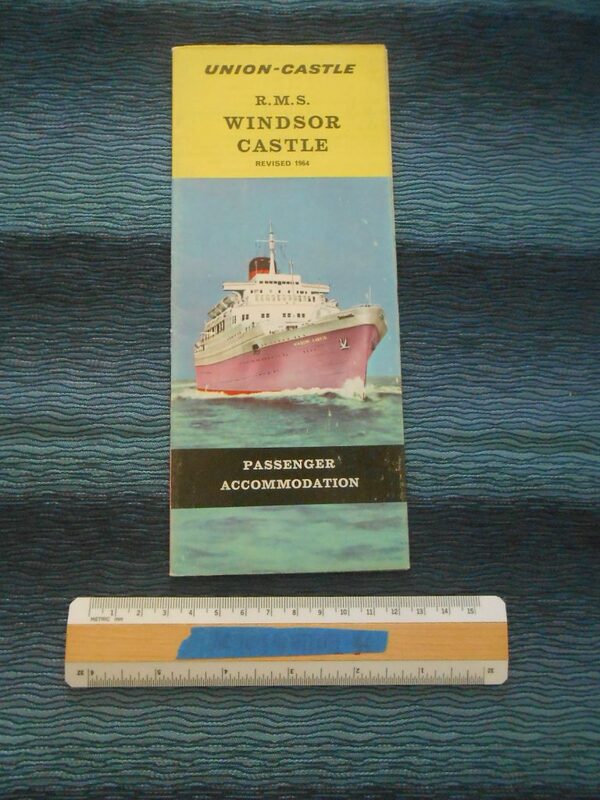 Lovely laminated cabinet from a tourist cabin on the Windsor Castle. Buddy Peter Knego saved all sorts of items from the ship when she was dismantled at Alang .. and this item is really cool. 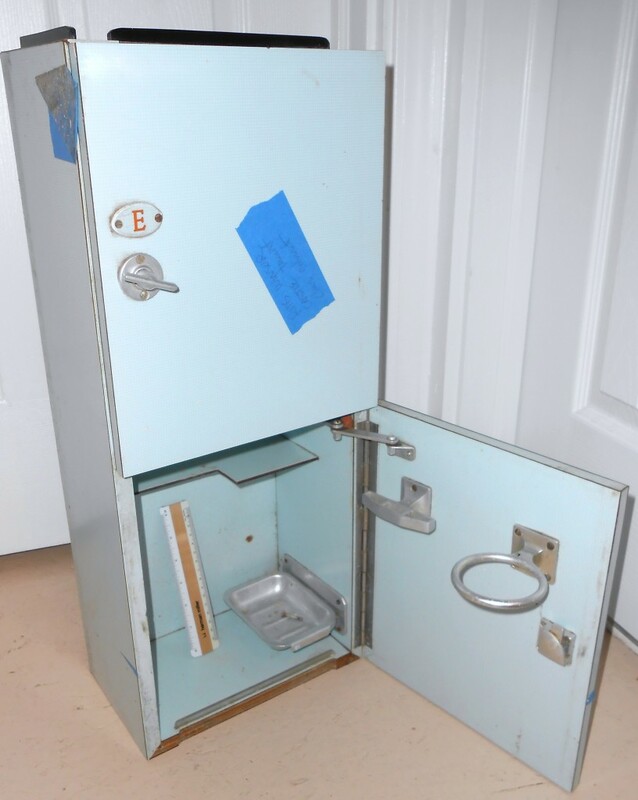 There would have been 2 of these in each 4 berth tourist cabin … so each occupant would have a little storage case for personal domestic hygiene supplies … like toothbrush and paste, bath soap, aftershave etc. There are little metal hardware dishes and holders inside for above items to store easily. There are areas of wear to the laminate .. but this could clean up nicely and still be used as a bathroom storage cubby today! . **shipping calculator may not be accurate .. shipping may have to be quoted ***. 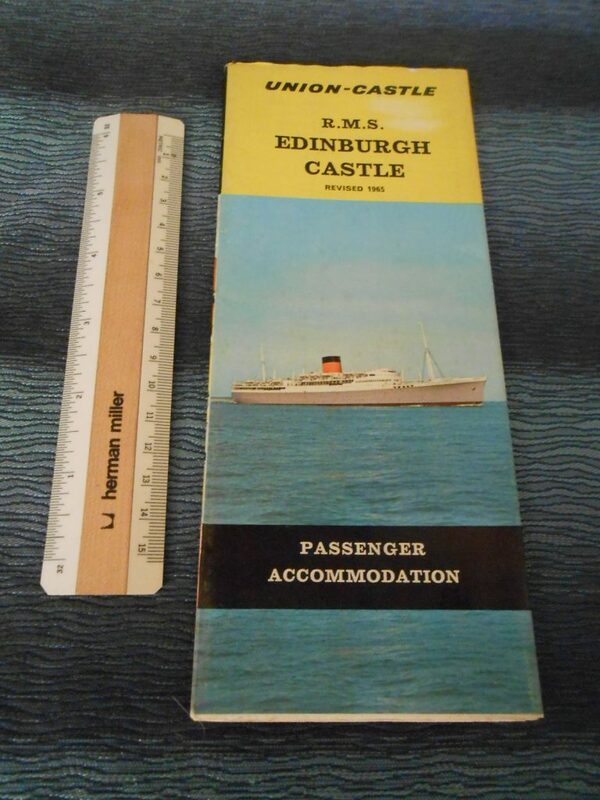 Directly from the onboard gift shop … a small charm for the RMS Edinburgh Castle. Really nice enamel ship crest. 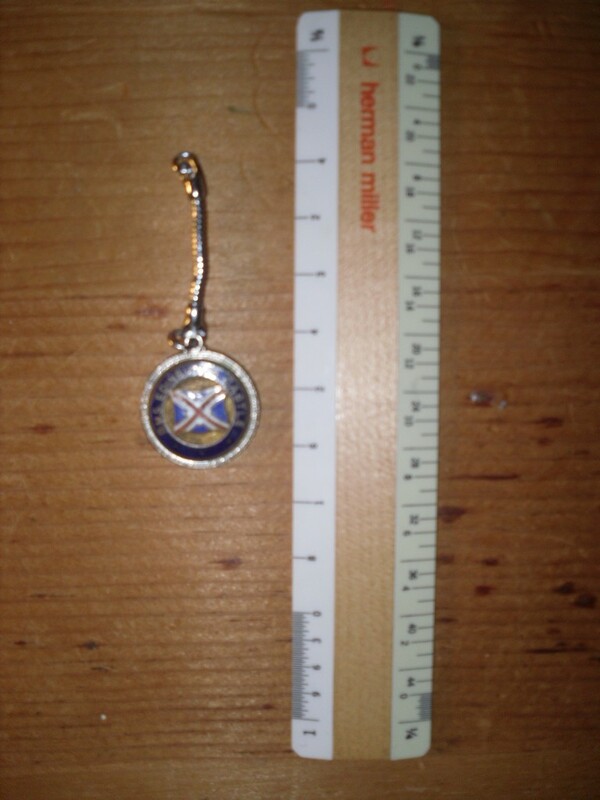 Looks like this may have been part of a keychain … but it would be great as a medallion on a neckless. 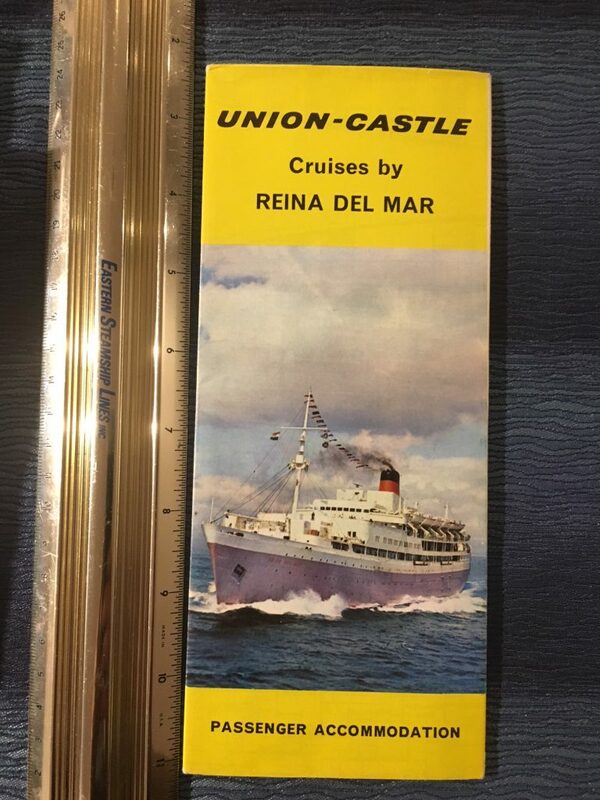 Directly from the onboard gift shop … and letter opener from the RMS Pretoria Castle. 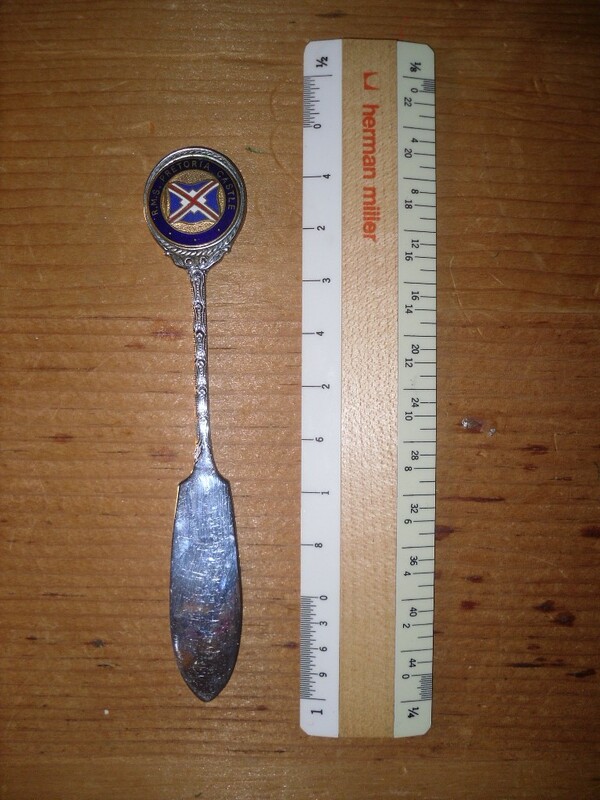 Really nice enamel ship crest crest and the blade looks hardly to have been used. Dr. Livingston never had such finery!